This unique village library building with its firewood stick facade was awarded the inaugural A$100,000 Moriyama Royal Institute of Canada prize in 2014 for transformative and emblematic architecture. He refers to it as a “modest” addition to the small village of Jiaojiehe – about two hours drive from busy Beijing urban life. The building, which won the inaugural Moriyama Royal Institute of Canada (RAIC) international prize of A$100,000 in 2014, forms a modern programmatic complement to the village by adding a small library and reading space within a setting of quiet contemplation and enhanced appreciation of the natural landscape. 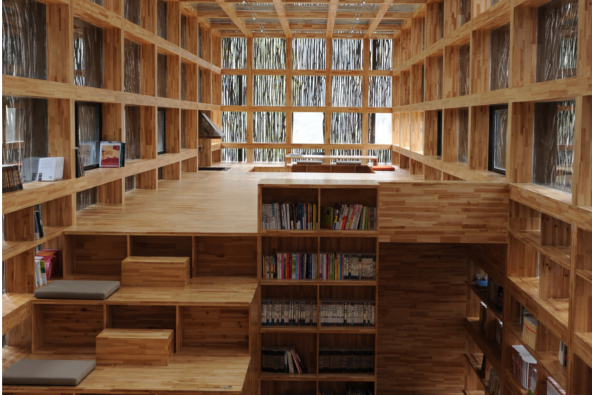 Instead of creating a new building inside the village centre, Li chose a site in the mountains five minutes walk away – a setting of clear thoughts when visitors consciously take the trouble to head for the reading room. Li’s hope that a well-designed building would improve life in the village and attract tourists has been exceeded beyond his wildest dreams. Story and pictures by special arrangement with timber+DESIGN International magazine. The building blends into the landscape and recognises regional characteristics through the delicate choice of materials and the careful placement of the building volume. Steel and glass are important to the mix of materials, but it is the locally sourced ‘sticks’ and boldly presented engineered pine inside where the real design statements are made. The architect found large amounts of locally sourced wooden sticks piled around all of the village houses to fuel their cooking stoves. “We decided to use this ordinary material in an extraordinary way – cladding the building in familiar textures in a way that is strikingly sensitive,” says Li. The sticks – including branches pruned from fruit trees – conceal a steel and glass box in the style of a Philip Johnson open plan design from the 1950s. “We chose the local branch material because it can be recycled from nature itself. It is not treated with any protection and I am expecting that the facade will become home for the local birds – thus increasing the building’s participation in nature. Inside there is strong, expressive character and special diversity, using steps and small level changes to create distinct places. Views toward surrounding landscapes are ‘framed’ and act as an embracing shelter. The building is glazed to allow for a full daylight space. The wooden sticks temper the bright light and spread it evenly to provide a perfect reading ambience. A cubic grid of structural timber (engineered pine) encloses the 175m2 library area, providing a uniform framework for stairs, windows and stepped seating. In keeping with the building’s clever architecture, the library itself operates to a simple but very effective model: entry is free but visitors are encouraged to bring two books to the library, and take just one back home from the collection – thus sustaining a vibrant hub of knowledge exchange. Framework is a direct adaptation of the historic small plate timber structures from Portland Oregon’s central Eastside. Commissioned by a couple in London, the designer overcame distance and logistics to produce a long lasting and beautiful piece of furniture. The natural character and beauty of the macassar ebony is showcased, and the sound environmental use of sustainably harvested products is championed.